Here's my first serious attempt at MyPaint, an open-source graphics application for digital painting. 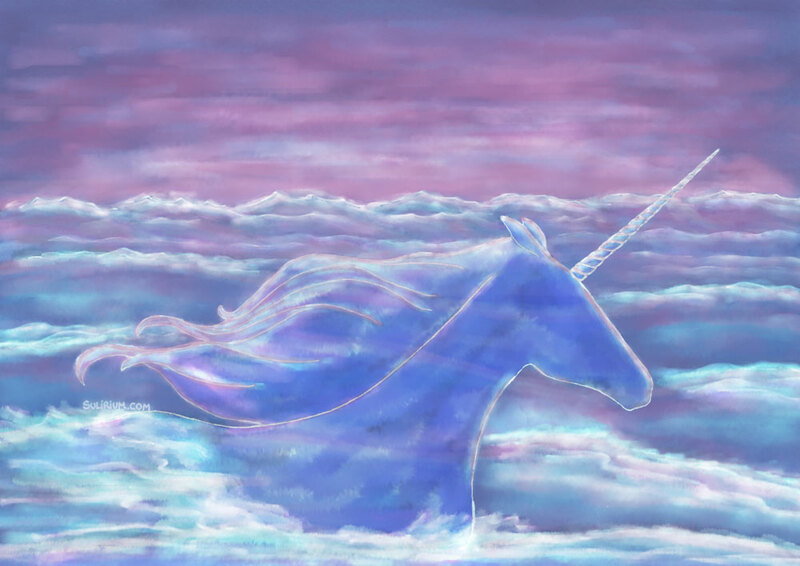 As for the image itself, I dedicate it to the animated movie from 1982, The Last Unicorn. I actually came up with the concept for this illustration some long years ago as part of an assignment, and I didn't realize until very recently what had influenced its conception. The mind is tricky like that. I wasn't even going to mention the movie, but then it hit me that this is very clearly an image I personally wouldn't have come up with if not for The Last Unicorn movie, even the color palette is influenced by it. So I thought I should reference and pay some homage to what was obviously my source material, a movie that is also one of my favorites since early childhood. But first, a bit about MyPaint. Where to download: instructions are on MyPaint website, where you can also find this basic user manual. Version that I used: 1.0 for Windows, 64 bit. There is a 1.1 version for Linux only, but a 1.2 version for Linux and Windows is being developed. Currently, no Mac versions seem available. What I like about it: It's free, light, very easy to use and comes with an amazing set of brushes. You can also create or add new brushes if you want, but what I like about MyPaint is that by default it comes with a really nice assortment to begin with. Primary focus: MyPaint is strictly for painting or drawing, not for editing images like, say, Photoshop. The intent is geared towards replicating a more traditional or less fussy way of painting in that it's just you, the canvas and your brushes, with the added plus of layers, undo/redo, zoom and some other minor features. In this sense it's very basic, you can't, at least in the version I used, select, crop, move, transform, mask, add effects or things like that. Importing images is also limited, it allows only one imported image per project. Thankfully it does have some of the typical layer blending modes like dodge, screen or multiply. But it's precisely this focus on just the painting that makes it so easy to use and not so heavy on your computer too. All in all, it's a pretty neat tool to have around, and can be used to complement a workflow with other tools (for instance, you can import MyPaint projects into Gimp, a free image editing software). Technical Inconveniences: I used it in Windows 8 and 7, with a Wacom Intuos Pro tablet. There were some minor issues in responsiveness, specially when re-ordering layers in the layers panel, it took several tries at times. But the buggiest aspect so far is with Windows 8, the responsiveness of the tablet pen is off or slow at the beginning of a stroke, but once you've started, it then flows fine. This becomes more problematic if doing very precise line work, but for what I was going for with my illustration it wasn't too much of a hassle. 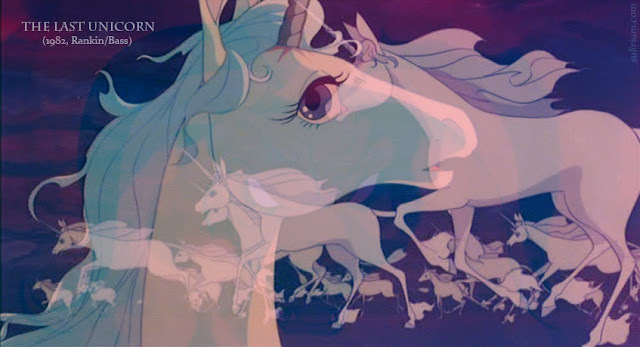 The Last Unicorn (by Rankin/Bass Productions) is kind of a cult film by now, it never was extremely popular but it tended to fascinate those who'd seen it. Many viewers, like me, watched it during childhood, but with lasting effect, since it was never strictly a children's movie, it mostly got better as we re-watched it as adults. The movie is based on a novel of the same name, by Peter S. Beagle, who also wrote the screenplay for the movie. The book isn't specifically for children either. This doesn't mean The Last Unicorn is for grown-ups only though, specially the movie. It addresses deep, complex human issues that affect both adults and children alike and does so through a language that both can understand to different degrees, the language of myth and of fairy-tales. So, although it is appreciated best as we grow older, it has a complexity that can potentially speak to people of almost any age; but whether you actually like it or not is more a matter of each individual. The Last Unicorn, like most good movies, books or other artistic products, lends itself to interpretation, with many layers of meaning. I've read the book and the essence of it remains in the movie (they were written by the same person after all), although they are both very different experiences. So I'm focusing primarily on the movie, since that is were I got the imagery for The Last Unicorn, which influenced my illustration above. The aspect of the movie that I would like to focus on is that it deals with something that is within all of us: our own mortality. The one certainty we have in our lives, the one thing we truly have in common with everybody else, is this inevitability. And it's something we are aware of since very young, the moment we become self-aware, when we can think "I am, I exist", we start to grasp our finite existence. I don't think we feel this or deal with it the same at every age, but as children we start perceiving this reality. And I believe this is point A for everything else we do in life, we have it with us always, not so much consciously thinking of it, but mostly knowing it, deep down, an inescapable reality. And it's hard, and some may deal with it better than others, but it will always be affecting us in one way or another, no one is really indifferent to it. And it's not something we can easily talk of or think about too directly, but we do need the feelings it elicits to be expressed somehow, to share its burden somehow, and story-telling is a way of doing this. And through stories we turn it into poetry, we use metaphors, we create an Other from which to observe our own selves. And this is what The Last Unicorn does (its protagonist an immortal creature, a unicorn): from the idea of immortality, we try to understand or cope with mortality. Now, The Last Unicorn movie is a story told through image and sound, like movies do, and as much as I would like to further explore the genius of how it goes about presenting its narrative, that would take a much longer post, or a whole series, to do it properly. So I'm just writing loosely about its themes here. The middle, the unicorn travels through man's road. The scenery becomes more realistic, with an earthier palette. For me the more interesting bits of the movie take place in this realm. The way I see it, the essence of mortality, of existence, is Change. Even something as eternal as the Sun is changing, slowly, constantly, and it too will disappear, along with our entire solar system; and so it happens throughout the universe. Nothing truly lasts forever (I could speak of Time, but what is time if not a continuum of small variations, that through accumulation become noticeable to us? The essence of time is also change). And with change comes Loss, change and loss are two major themes in the movie. Something changes and it's not how it was before, things are gained but also lost, it's how the world is, in order to find something, you have to lose something else. Existence is full of these opposing forces, constantly balancing themselves off one another, and if we don't appreciate this need for balance, if we can't accept change, and can't learn to let go of whatever is being lost, well, the movie addresses this in its own poetic and disturbing way. Unable to let go, growth is stunted, we become reduced to a selfish, miserable obsession, and eventually get swallowed up by the relentless motion of change just the same. Nobody is saying it's easy, but, if we can learn to let go, and not waste our energies on pretending to avoid inevitable change, if we allow ourselves to mourn that which is lost, then, well, it's a bit like magic (an important element in the film), things just start falling into place, we flow, we learn, we grow, we rediscover things around us, we become a bit more able to help ourselves and others, a bit more truthful, and strangely enough, a bit more alive. everything is less saturated, colder, barer (a journey of self-discovery requires descending into one's nightmares). And so it is sung in the main song of The Last Unicorn, which states in its chorus "I'm alive". And it comes down to this. To live is to change, to change is also to die. There is no special secret, and no consolation prize; because we know of death, that it surrounds us, and is within us always, we also know that we are alive, and knowing this, experiencing it, is no small thing, it is everything, whether we can appreciate it fully or not, is up to us. So, because the movie deals with all this, and is not pretentious, cheesy or dishonest about it, is partly why it means so much to me, and to many others as well, for whom it is one of those little treasures of a movie, a true gem of animated cinema.